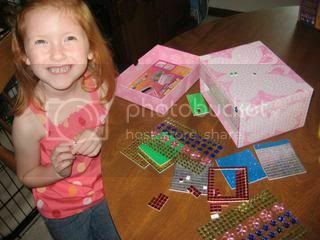 The craft queen loves herself a craft kit. This one she got for her birthday from her grandparents. 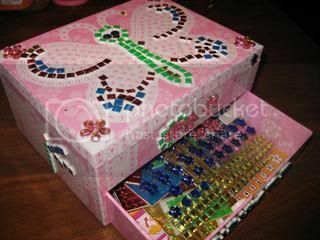 It's like a sticker-by-number situation with sparkles and jewels. What's not to like? Michaels, Hobby Lobby, Wal-Mart, the Dollar Store, and of course, Oriental Trading all have craft kits. I'm not sure what to do with all the crafts afterwards, but we sure like making them!